Panderbear presents a Truth Quotient (TQ) ratings table about once per month even when, as this time, nothing much has changed. 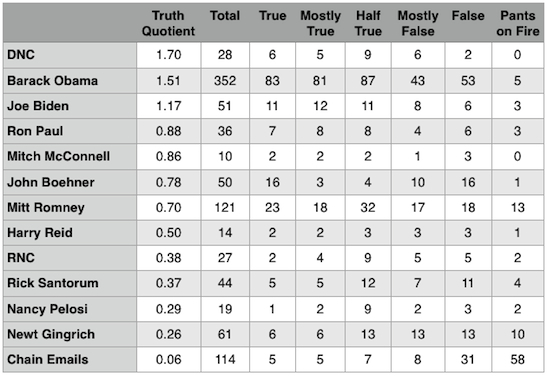 The DNC, President Obama, and VP Biden remain the only contenders above water (TQ=1.0). Congressional leaders, whose statements have been largely ignored by fact-check websites during the course of the Republican nomination race, remain, as always, in dubious TQ territory. The candidates for the nomination were little moved from their former ratings, though Mitt Romney continued his ever so gradual glide path downward. Panderbear anxiously awaits the end of the nomination process when we enter Double Jeopardy where scores can really change.